If you spend any time in Mexico or Guatemala, you’re going to need a list of the best mariachi songs to request. These roving musicians are an essential ingredient for a fiesta, birthday party, romantic dinner or beach day under a palapa on one of Mexico’s beautiful beaches. The first time ever I heard a mariachi sing was at a dinner club in Guadalajara, the heart of the mariachi world in Mexico. I was seated in the front row of a wooden stage and every time the mariachi stomped his cowboy boot, vibrations would ripple across the stage down into my toes. He sang of love, loss and betrayal and looked straight into my eyes. It didn’t matter to me that he was portly, wore a shiny, sequinned shirt and big sombrero, by the end of the first set I was madly in love. My swooning turned out to be the beginning of a bout of food poisoning and I spent the remainder of my 3-day stay in Guadalajara, on the floor at the Hotel San Francisco Plaza, Although I left Guadalajara without seeing my mariachi again, the memory of his songs stayed with me. 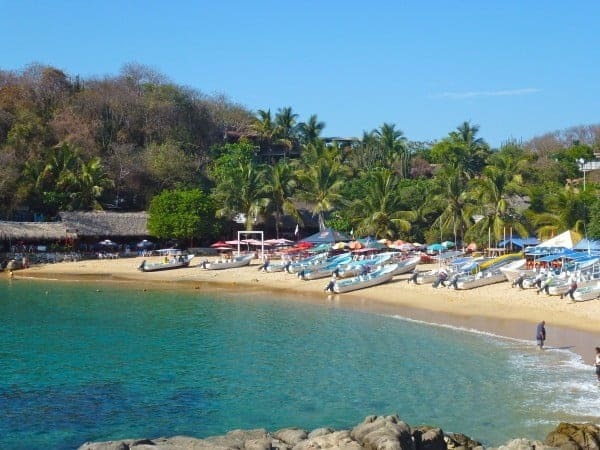 Insider Tip: Volaris Airlines offers direct flights between Guadalajara and Puerto Escondido so you can create the perfect combo of mariachi music and beach time on your next vacation in Mexico! Since then we’ve enjoyed mariachi music at La Palapa de Carrasco on Manzanillo Beach in Puerto Escondido. 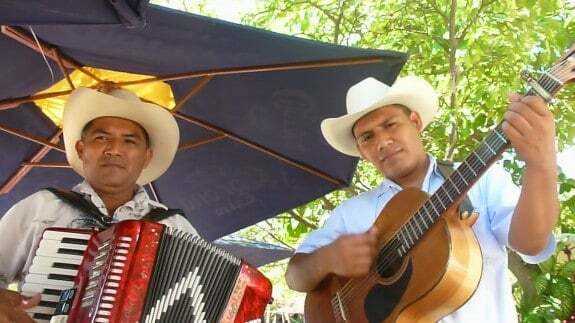 While they are officially known as roving troubadours (they’re not officially mariachis because they’re not wearing charro suits or accompanied by a full orchestra) it’s still handy to have a list of the best mariachi band songs to request so you don’t listen to endless rounds of Cielito Linda. Do you want a happy mariachi song or one of the classic romantic mariachi songs? 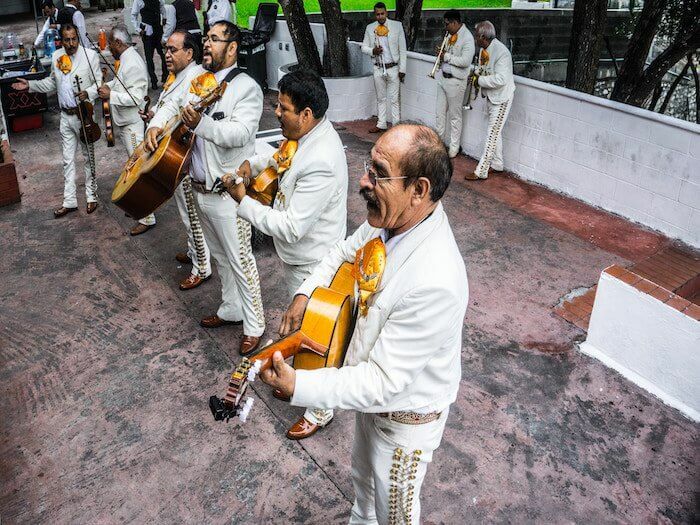 Knowing which mariachi songs to request can help set the mood you want to create – be it upbeat to dance to or set a romantic atmosphere for you and a loved one. Given my husband is from Guatemala (and not everyone wants to listen to the song Soy de Zacapa), to create our playlist we appealed to our friends from Mexico for advice. Together we came up with a playlist of canciones that were sad, political and wildly romantic. There were even a few cumbias perfect for dancing. Here’s a mariachi song list to request at a birthday party, a Cinco de Mayo party, Day of the Dead or beach day. 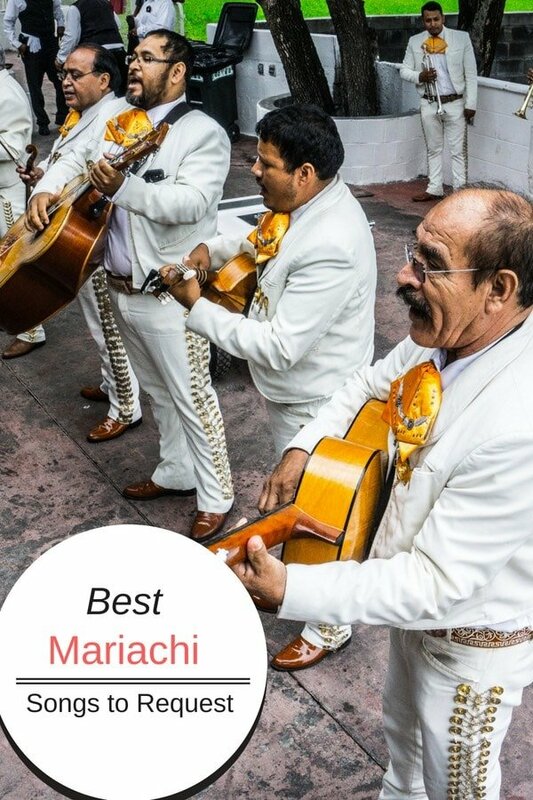 They include top mariachi songs for dancing, fun mariachi songs and love ballads plus a few of the most famous mariachi songs. Wondering about the best mariachi song for dancing? Check out this version of El Mariachi Loco …it’s guaranteed to make you want to get up and dance! If you’re at a beach in Mexico, we recently paid 100 pesos for three songs. In USD that works out to be around $5 so is definitely worth it when it comes to creating the perfect soundtrack to a day at the beach. 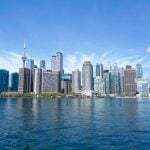 If you hire a mariachi band to come to your home for a party such as a milestone birthday celebration or party, it’s quite a bit different than just requesting a song at the beach or a restaurant. You have to consider other factors besides just choosing the best mariachis songs for the evening. Determine how many musicians you want. Decide what time you want them to arrive. Don’t get them too early as you want to be sure all your guests have arrived before they start playing. Arrange transportation such as a mini-van for the mariachis if they don’t have their own. Determine if cost is per song or by the hour. You can usually count on 12- 15 songs per hour. Create sufficient space for the musicians to play and for a dance floor. Expect to serve the mariachis dinner if the gig is for more than an hour. 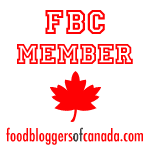 Tipping isn’t generally expected but is welcomed if they play extra songs. 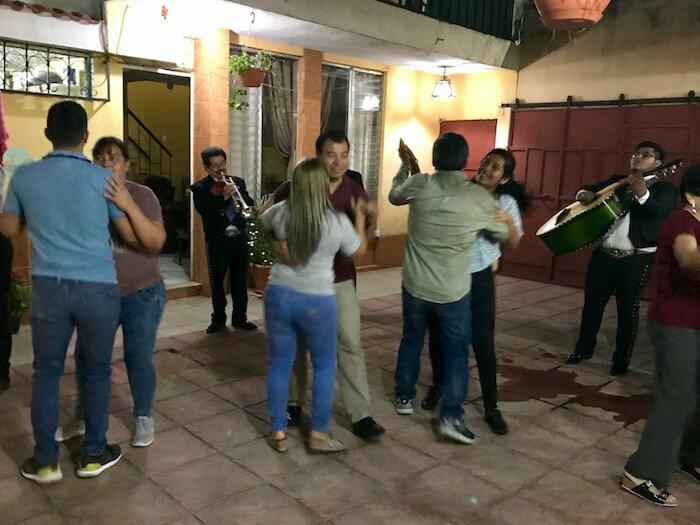 Finally, at the end of your event, note which songs were the most popular among your guests – the best mariachi songs are the ones that get people up dancing or singing along. Be sure add those songs to the list at your next event. Do you have a favourite mariachi song? Let me know. I’d love to add it to our list of the best mariachi songs to request! Love mariachi music! Sounds like a lovely place to relax. I always feel uncomfortable when roving musicians stop at my table. I don’t know what to do, where to look or how much to give them. And so I never even enjoy the music until they’re at someone else’s table. You’ve inspired me to actually sit back and listen. You can always sing along! People also wonder what to pay. 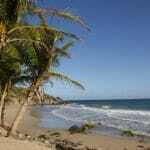 In Puerto Escondido it was 50 pesos a song ( or 3 for 100 pesos) and in San Miguel it’s 60 or around $4. I laughed so hard reading this post. I just returned from Mexico and don’t know why I waited so long to travel there. I know the musicians really need the money but I also feel weird about having them play for me. Look up, look down? Eat my food? Get up and dance?? Next time, I’ll go with the dancing I think! That’s the spirit! When in doubt – dance! I’m afraid I’m one of those uptight gringas who would rather the mariachis didn’t stop at our table. However, if they’re going to do so anyway and they’re going to expect a tip even though you didn’t ask them to stop next to you, I suppose it’s good to at least have a song in mind that you’d like them to play. Now, the trick is going to be remembering where I’ve stored your list. 😉 (First world problem). Once you get to the beer and ceviche the mariachi music can be just about anything. 😉 Even though I think it’s Cuban, Guantanamera is a good one too. We usually sing “One ton of mayo.” We’re idiots. Hearing a mariachi band is always so uplifting! When we go to Cabo, there is a “Cabo song” we always request. When we attended a wedding to Ciudad Obregon, a mariachi band played outside the bride’s parents home, which was so charming! I love the roaming mariachi bands especially if I’ve had a few cervezas. I just love hearing the local music and often purchase a CD if they have one. Nothing is more fun than to play music from a trip make some nachos and relive the fun times. Mariachi and mezcal? Count me in! I love the entire country of Mexico and usually visit at least once a year.